Whether you’re heading off the beaten track for a quad trek, quad safari, ramble or race, you’re guaranteed some muddy good fun. However, it’s important you’re prepared for your off-road adventure, and with that in mind we’ve created our top tips for first time riders! Quad biking is an outdoor activity that usually goes ahead whatever the weather, so it’s important that you dress appropriately. Some venues may provide overalls, but we recommend wearing old clothes that you don’t mind getting a bit muddy or wet in. Don’t let the weather put you off, it’s all part of the fun! Before heading out on the quad bikes you’ll be given a full briefing, which gives you the perfect opportunity to ask our expert instructors any questions you may have. You’ll also be given some time to get used to driving the quad bikes, so make the most of the chance to build your confidence at the controls. Sitting on the quad bike correctly will not only guarantee you a comfortable ride, it also helps when it comes to negotiating off-road obstacles such as bumps and hills. Try to sit up straight, look ahead and grip the quad bike with your knees. A relaxed riding position will help you no end. Keep your eyes on the trail at all times, as even the slightest lapse in concentration can lead to a costly mistake. Branches, stumps and rocks are all obstacles you should keep your eyes peeled for. Being ‘rider active’ means using your bodyweight to help the quad with obstacles such as hills, corners and ditches. Shifting your body weight at the right time will help you overcome almost any obstacle. Quad Biking for a Stag Do? Being the chosen one to organise a stag do should be an honour, but more often that not it can be a torturous headache as you wade through dozens of websites trying to find the right event for you best mate. Luckily for you, you landed on the right website and found the right event. Why is Quad Biking good for a Stag do? It’s the most exhilarating and thrill-filled sports activity. It allows you to get behind the wheel of our top of the range Quad Bikes which combine speed and power with a super springy suspension, providing you with the perfect vehicle to tackle the texture of the muddy terrain. The adverse conditions of our luxurious countryside venues provide you with a bumpy, muddy and extremely fun yet difficult, challenging ride. You can select different packages depending on what you’re wanting to do too. What package is best for a Stag do? The Quad Taster/Challenge allows you to get used to the Quad bikes in your own time after you’ve received the proper safety gear and a safety briefing from our qualified instructors. This experience is a non-race format and allows you to get used to the quad bikes in your own time. We also have the Quad Trek/Safari which takes you through all the tricky scenarios that nature will throw at you for approximately an hour, depending on the package purchased. From darting through clear fields at top speeds or tackling the puddles and bumps cautiously as you make your way down into the forest, you and your lads will be alongside each other making memories that will last a lifetime. Quad Biking is the event for you and with over 60 quad biking venues nationwide, seen if you click here, we can guarantee that you’ll find a perfect location for you and the lads to burn some rubber before you head out into the nearby party town to celebrate the Grooms last night of freedom. With some of our venues having up to 50 bikes available we are able to accommodate even the biggest stag parties. 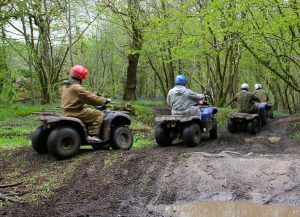 Author adminPosted on January 9, 2019 January 9, 2019 Categories Quad Basics, Quad BikingTags quad ramble, stagactivity, stagdoLeave a comment on Quad Biking for a Stag Do? Quad bikes are built to conquer all conditions, but with winter weather even the best ATVs are about to be pushed to the limit. That shouldn’t stop you quad biking though, because whatever the weather, winter’s the perfect time for an off-road adventure. So without further ado, here’s our top tips on surviving a winter quad biking experience. Your hands are used for both steering and acceleration, which means keeping them warm is key. You don’t necessarily need to splash out on a pair of expensive gloves though, as long as your usual winter warmers don’t restrict your movement they’ll do the job perfectly. Some venues even provide gloves, but it’s better to be prepared and take your own. Not only do instructors know how to get the best out of a quad bike, they know where the most difficult obstacles are and how to tackle them. In the worst of the winter weather even experienced quad bikers can be caught out, so listen to your instructor carefully and follow their lead – they’ll help you conquer almost any obstacle. A smooth driving style brings the best out of a quad bike regardless of the conditions, but it’s even more important to stay smooth when the course is covered in mud or snow. Erratic steering and acceleration only increases the chances of a rider losing control. The protective overalls provided at most quad biking venues are designed to keep you clean, and not necessarily warm. So it’s important to dress for the weather, pack waterproofs and wear as many thin, warm layers as possible. Once the adrenaline kicks in you’ll warm up anyway! The winter weather guarantees thrills, spills and lots of fun, which means there’s no better time to head out on an off-road adventure. Don’t let a bit of mud and rain put you off experiencing this incredible activity, dive in at the deep end and embrace the challenging conditions! To book your winter quad biking experience visit our website today. Quad Bikes vs. Motocross Bikes – Which Is Best for You? So, you’re in the market for a new off-roading machine, but with all the options available on the market these days, what kind of vehicle do you choose? Thirty-odd years ago, this would have been a completely one-sided debate, as quad bikes were only introduced in 1983. Now this question is fiercely contested. Like many things in life, there is no clear-cut answer and it all depends on what you’re going to use it for. So, without further ado, we here at Quad Nation are here to help you find out whether a quad bike or a motocross bike is the vehicle for you. If you’re looking to acquire a new vehicle based purely on speed and exhilaration, then it’s probably best to get a motocross bike. However, that’s not to say that quad bikes are slouches at all. For example, one quad bike – the Yamaha 700 can reach speeds of up to 90mph! Now that’s more speed than anyone ever needs. Quad bikes are warriors. This is a well known fact, as they were initially introduced to the farming community for use on tricky terrain. So, for obvious reasons, quad bikes win the toughness round hands down. Users have the ability to carry a lot more equipment when compared to a motocross bike and this can even be expanded with the addition of a trailer! In essence, a quad bike can act like a small tractor – so it’s obviously very useful in a farming environment. Whether you need to pull logs, carry hay bales or water barrels, the quad bike makes easy work of it all. As expected, these tasks would be much more difficult if you were to use a motocross bike. Size has an important part to play when considering agility. Quad bikes can be a lot more cumbersome when manoeuvring compared to the more lightweight, slimmer motocross bike. This makes squeezing through tight gaps on a motocross bike – well, a breeze. Beneath the chassis of both off-roading machines, the two are quite similar. Despite the motors being nearly exactly the same in both the quad bike and the motocross bike, the quad makes the least noise out of the two. However, most people tend to get to grips with a quad bike easier than they would with a motocross bike. You must be sure to be mindful of riding each vehicle in a safe manner as they both present their own safety risks. Falling off a motocross bike can be painful, no doubt. However, flipping a quad bike can result in very serious injuries. No matter which one you ride, it’s paramount that you take care on both. If you’re looking to ride your new off-road machine in professional race situations, then it’s hard to beat the motocross bike. With its manoeuvring capabilities and speed, the motocross bike can tackle tough terrain at both fast and slow speeds. If you’re looking to get airborne from a few dirt jumps, then the lighter-weight motocross bike beats the motocross bike in that department. This is dependent on which make and model you choose, but the chances are that the motocross will indeed be smaller in size and weight when compared to a quad bike. You’d be able to fit two motocross bikes in the space required for a single quad bike. So, if you’re tight on space, then a motocross bike may well be the one for you! So, there we have it! If you’re considering purchasing either a quad bike or a motocross bike, then hopefully this short guide will have cleared up a few issues you may have had. So, if you’re looking for a speed demon and you don’t have much storage space to spare, then a motocross bike would be the preferred choice for you. 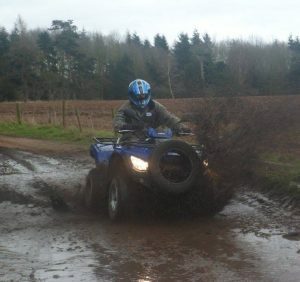 But, if you’re after a reliable workhorse with an appetite for graft, sturdiness and mud, then the quad bike is for you! Both the quad and the motocross have their pros and cons, but the most important thing to remember is to have fun and be safe. Author adminPosted on November 13, 2018 November 9, 2018 Categories Features, Off RoadingTags motocross, motocross bikes, Quad BikesLeave a comment on Quad Bikes vs. Motocross Bikes – Which Is Best for You? Our Northolt Site Wins Venue of the Month for October! Winter is here – cue rain, wind, and even more rain! That might be bad news for most of us, but not for us quadders! What better way to make the most of the mud than climbing on board a four-wheeled beast for an awesome experience? And we’ve only gone and hand-picked a Venue of the Month for October for you to enjoy at your leisure. So, if you’re looking to get in touch with your mud demon, then our Northolt venue is the ideal place for you to do just that. This fast-paced thrill ride features a plethora of steep hill inclines and declines, bumpy woodland trails and plenty of swamps and streams to splash around in. Thankfully, the four wheeled beasts at your disposal handle all of the terrain you encounter with absolute ease! Our Northolt venue is ideal for individual rides, as well as team-building events – whether that’s corporate, a stag or hen do, or – dare we say it – a Christmas party! Our quad biking events use 150cc quads, while junior quad bikes are also available. Impressed with the glowing feedback Northholt have received? Why not try out an experience first hand. You can find out more information and book online by following this link. Author adminPosted on November 9, 2018 November 8, 2018 Categories Venue Of The MonthTags london quad biking, northolt quad bikes, northolt quad biking, quad biking london, quad biking northoltLeave a comment on Our Northolt Site Wins Venue of the Month for October! We know that it’s probably way too soon to be mentioning the dreaded C word. But, if you take a look at any of your local supermarkets, you’ll find that the shelves are already being stocked full of Christmas merchandise. On that note, it’s safe to say that planning your work’s Christmas do is something that will be on your agenda sooner rather than later. After all, many people like to book early to avoid disappointment. A team-building activity is certainly no different, so if you’re looking for something that differs from your average meal and drinks this festive period, then you’ll find that Quad Biking is more than ideal. Read on, and you’ll discover exactly why. Providing a truly unforgettable experience from the get go, you’ll encounter muddy pools, steep inclines and declines, and so much more. So, you can most definitely expect to have your off-road driving skills tested to the absolute max. You’ll need to pay particular attention to the handling and controls of the quad bike, but you’ll find that these robust machines will do most of the hard work for you. If there are any first timers within your group, then you’ll find that there’s no need for them to worry. Quad Biking is completely exhilarating whether you’ve been quadding for years or if you’re a complete newbie. Plus, your session will begin with a complete safety briefing and instruction from a friendly and experienced instructor. They certainly know a thing or two about taking on all kinds of tough terrain! All in all, it can be said that due to the highly beginner-friendly nature of Quad Biking, you’ll find that those both young and old will be in for an action-packed event from the very start. This makes for a team-building event that you’ll all remember for years to come. So, get ready to climb on board and prepare for an awesome muddy adventure – that’s exactly what’s in store for you! This certainly beats the usual after work drinks and Christmas meal, right? Of course, that’s something you could squeeze after your experience if you’d like! Quad Nation can happily boast several of the finest venues across the UK and Ireland. So, there’s sure to be one that’s within easy reach for your Christmas team-building event. To find out more information, visit the following link and you can do exactly that. Skipton Quads Wins our Venue of the Month Award! The British countryside is absolutely jam-packed full of magnificent scenery. So, what better way to make the most out of the views than climbing on board for an epic four-wheeled experience? An ideal place to do exactly that is at our superb Skipton venue, which just so happens to be our venue of the month winner for September! So, read on as we tell you all about this epic site. If you’re looking to get in touch with your inner adventurer, then our Skipton site is most definitely worth a visit. After all, there’s over 160 acres of blissful Yorkshire countryside just laying in wait for you to explore! From giant muddy muddles to sheltered woodlands, you’ll encounter all kinds of tough terrain along the awesome off-road trail. Thankfully, the four wheeled beasts at your disposal will make easy work of any terrain which you come across. As well as this, there’s quad treks available for both kids and adults too, so there really is something for everyone at this fantastic site! That’s not all though, you’ll be happy to know that thanks to the highly experienced instructors, you’ll be left in more than capable hands throughout the duration of your experience. This means that even complete beginners are more than welcome to join in! “We are very happy and we have recommended it to everyone”. “The course and the bikes were fabulous fun and to be thoroughly recommended to anyone thinking of giving it a go!”. If you were impressed by the glowing feedback Skipton have received and think that it would be the ideal location for your next adventure, you can visit the following link to find out more information. Author adminPosted on September 28, 2018 September 14, 2018 Categories Venue Of The MonthTags quad biking skipton, skipton quad bikingLeave a comment on Skipton Quads Wins our Venue of the Month Award! We here at Quad Nation absolutely love all things adventure, especially where four-wheeled action is concerned. After all, what could be better than climbing on board a quad bike and getting in touch with your inner explorer? Across the globe, there are a whole host of destinations for you to do exactly that, and in the following blog post, we take a look at the best places to visit around the world for a Quad Biking experience. So, read on and discover where you can get your fix of adventure in 2018. Thailand is undoubtedly one of the most beautiful countries in the world, with several stunning beaches, vibrant culture, and outstanding natural landscape. So, what better way to explore the surroundings than on board an awesome four-wheeled vehicle? Ko Samui is Thailand’s second largest island, and is full of mountainous rainforest, beautiful golden beaches, and so much more. This provides perfect conditions for a Quad Biking experience. Along the way, you’ll encounter a whole host of superb viewpoints and a wonderful hidden waterfall too. What’s more, you could even pay a visit to the Big Buddha Temple, complete with a 12-metre seated Buddha statue – one of the island’s most popular tourist attractions. Forming part of the Canary Islands, Tenerife is full of absolutely stunning scenery, and brings in millions of tourists every year. The island is the perfect place for a Quad Biking experience too – particularly in the truly wonderful Teide National Park. This just so happens to be where Mount Teide is located, which is known as the highest point in the whole of Spain at 3,718 metres (12,198 feet) above sea level. Taking in the Canarian culture throughout your experience, be prepared to have your breath taken away at the Boca de Tauce view point – offering unparalleled views of the island and its volcanic landscapes. A former Portuguese colony, Cape Verde lies off the coast of Africa, and provides the perfect setting for a truly exhilarating Quad Biking experience. Boasting a similar climate to Tenerife and the other Canary Islands, the weather is pretty much guaranteed to be on your side all year round. So, what better way to catch some rays than on board a four-wheeled beast?! Gorgeous panoramic trails are exactly what you can expect to encounter throughout your experience, not to mention the varied terrain which ranges from sand dunes to beaches. One of the most popular Quad Biking tours is located on the island of Boa Vista, which comes complete with moon-like volcanic landscapes for a four-wheeled adventure that you’ll never forget. Zoom across the yellow sands, rocky ravines, and sand dunes at this popular tourist destination, and prepare for an adventure that you’ll never forget. Along the way, you’ll get the chance to immerse yourself in the culture – exploring villages and discovering how the locals live their daily lives. There’s plenty of stunning scenery to enjoy throughout the experience, from Mount Senai to the Pharaonic Valley. So, if it’s unspoiled natural beauty you’re in search of, then that’s exactly what you’re guaranteed when you take part in a Quad Biking experience within this beautiful African country. When you think of Ibiza, the vibrant nightlife scene is probably the first thing which springs to mind, right? Well, Ibiza also boasts plenty of natural landscape too, which makes for a fantastic destination for a Quad Biking experience. Explore every corner of the island on board one of the state of the art Quad Bikes, and you’ll be able to take on all kinds of terrain with sheer ease. There’s a mixture of on and off-road tracks, and along your route you’ll be able to take in views of iconic rock formations, picturesque countryside, and so much more. Iceland is without a doubt one of those places which you need to visit at least once in your lifetime. After all, it’s the perfect place to witness the truly stunning Northern Lights. There are plenty of tours available in the Icelandic capital of Reykjavík, but some of the best include a mountain safari, in which you’ll work your way towards the top of Hafrafell Mountain – encountering plenty of rocky lava terrain and stunning panoramic views along the way. There’s also the midnight sun tour, which is a truly unforgettable experience. You’ll get the chance to witness the golden and orange skies above you, as well as enjoying unbelievable views of the Hafrafell and Úlfarsfell mountains. Rocky paths, steep slopes, and gravel roads are exactly what you’ll have to contend with along the way. Luckily, the four-wheeled beasts at your disposal will make easy work of any terrain which stands in your way. If you’re in search of the ultimate adventure, then you can’t go wrong by visiting either of Quad Nation’s top Quad Biking destinations for 2018. Whichever one you decide to visit, then an unforgettable experience is exactly what you’re guaranteed. But, if you’re looking to get your fix of awesome four-wheeled action on home turf, then you can rest assured that Quad Nation has your back. After all, we can proudly boast some of the best Quad Biking venues across the UK and Ireland. To find out more about your nearest venue, click the following link and you can do exactly that. Market Harborough Wins Venue of the Month for August! Here at Quad Nation, we’re always on the lookout for all the latest and greatest in the totally exhilarating world of Quad Biking. We boast some of the finest venues you’ll find anywhere across the UK and Ireland – with each and every one of them delivering when it comes to awesome four-wheeled action! For that reason, making our decision on the winner of the month award is always a tough one. But, after much debate, we came to the conclusion that there can only be one winner this month. So, without any further ado, we’d like to express our congratulations to Market Harborough – the winners of the August award! A whopping 400 acres of blissful Midlands countryside is at your disposal when you visit this fantastic venue, meaning it couldn’t be more perfect for getting in touch with your inner adventurer! You’ll be climbing on board one of the high-powered 250cc Honda Quads throughout your experience – a four-wheeled beast which handles all kinds of tough terrain with ease! “It was a great experience! me and my partner had a great day! “Brilliant way to spend a couple of hours if you like the adrenalin rush”. Judging by the rave reviews left by those who have visited Market Harborough, you’d be foolish not to consider them next time you’re looking to get your fix of adventure! To find out more information, head on over to our main website now. Author adminPosted on August 24, 2018 September 14, 2018 Categories Venue Of The MonthTags market harborough quad biking, quad biking market harboroughLeave a comment on Market Harborough Wins Venue of the Month for August! July’s Venue of the Month is Durham Quads! It doesn’t seem so long since we awarded our last venue of the month award. However, the time is here once again! So, without any further ado, we’re proud to announce that the award for July goes to none other than Durham Quad Biking! There’s a whopping 200 acres of blissful County Durham countryside at your disposal when you visit this spectacular venue. This makes for the perfect place to embark on an epic muddy adventure on board a high powered Quad! There’s Suzuki and Yamaha quad bikes at your disposal too – both of which are specially designed to handle all kinds of tough terrain with ease! “Excellent course, and treks through woodlands, really enjoyable, so much fun! would definitely recommend it”. So, there you have it! If you like the sound of Durham Quad Biking and would like to play your part in all the rip-roaring action for yourself, then head on over to our main website now where you can find out more information. 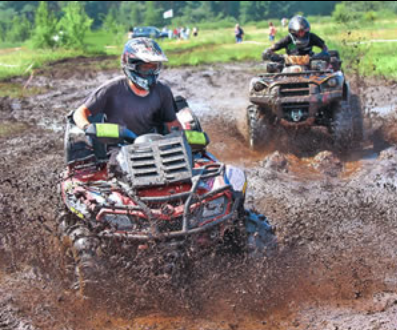 Author adminPosted on July 31, 2018 Categories Venue Of The MonthTags durham quad biking, quad biking durhamLeave a comment on July’s Venue of the Month is Durham Quads!